Is the Clinical Director at the Vargo PT Sherman Oaks clinic. He is a licensed Physical Therapist, an ASTYM certified clinician, a Certified Strength and Conditioning Specialist, a Doctor of Physical Therapy and is CPR certified. He specializes in outpatient orthopedics and sports physical therapy. Mr. Eaton earned his Bachelor’s degree in Kinesiology from San Diego State University with an emphasis in pre-physical therapy and later earned his Doctorate in Physical Therapy from Western University of Health Sciences. He has a variety of clinical experience within the different fields of physical therapy with his emphasis being in orthopedics and sports rehab. 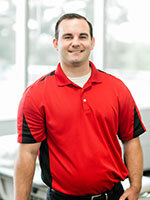 Steven is a member of the American Physical Therapy Association. His hobbies include maintaining physical fitness, playing recreational sports, and spending time with his English bulldog.